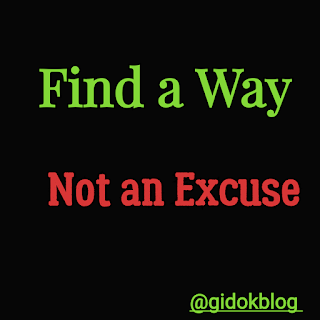 Often times it is very easy to find excuse when one has a particular task in hand to accomplish rather than finding a way to execute such task which is a major hindrance to becoming successful in life. The most successful men and women in the world today did not just rise to stardom overnight and they did not become successful by always looking for an excuse when the going gets tough rather they tried there very best to accomplish that particular task regardless of it's stiffness. 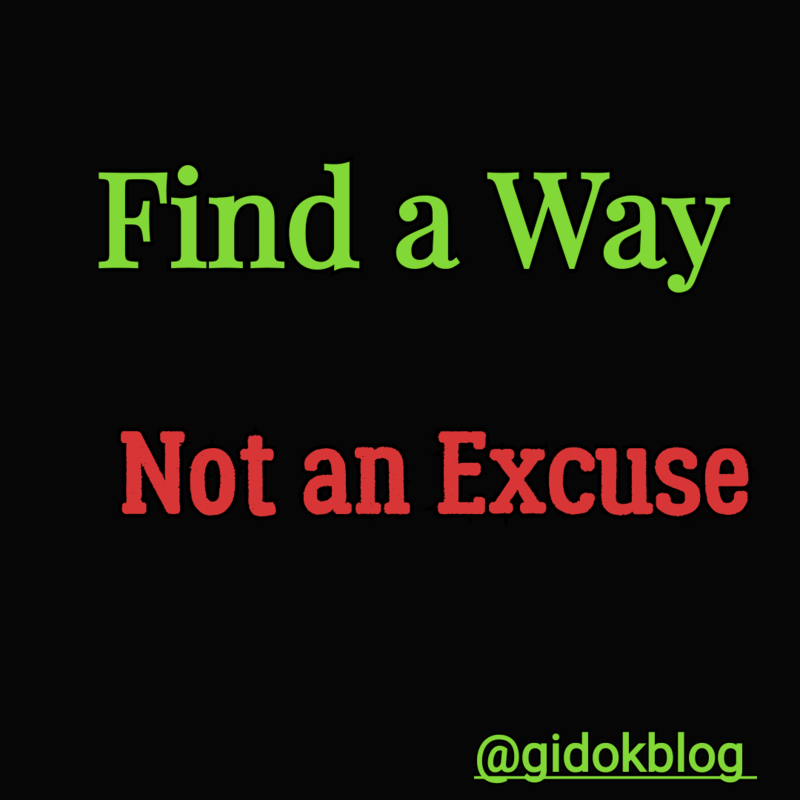 One thing with finding excuses is this- when you make it a habit, finding excuses when the task seems insurmountable, you will never attain success in life. Success requires perseverance and total commitment, so when it seems the task in hand is difficult or looks impossible "persevere" and trust me it can only get better. * Do not see it as a major challenge. *Do not see it as impossible. *See yourself accomplishing the task. *Do not surmount to pressure. *Commit your 100% to it. *Never give up no matter the odds. Remember: not everything is as it seems, stop making excuses today and find a way. I agree with you on all of your tips. Sometimes I feel like something is impossible until I sit down and find a way, and I always find a way. This is timely for me. There're things I have to prioritise this year and I've been wondering if some things I'm making an excuse not to do them OR if I'm actually putting them aside just for now. This just reminded me the tough things I can find ways to do them without making excuses not to. Am happy to hear that i reminded you of that.. All the best Tee. The first step is convincing yourself not to make excuses and the second step is to break the habit! I totally agree. Once you convince yourself that you can do something, if you have the drive then you truly can do anything. I totally agree! Sometime an excuse might be easier but not the way to go. The extra work/truth will be better for all in the end! I agree with all 8 guides to help us not make excuses. I agree we need to persevere. Having a positive attitude helps when facing any situation and it is what helps me persevere and to follow the other 7 guides. These 8 tips are good ones. I need to live by a lot of these more often, especially being more positive. Positivism can take you pretty far. Very helpful article. These tips are really helpful. Thanks for sharing. Amen. A little effort goes a long way. Great tips. As the saying goes: "What the mind perceives the body can achieve"-mind over matter. And we just have to have faith in ourselves to make things happen. Its so much easy to find an excuse than solve a problem. Its not easy at all and I do admit I do have those moments. But one thing I always do is stay positive no matter how bad the situation is. Hope everybody finds their solutions not more problems. Making excuses is something that we do way too often. Finding a way to make something work for you, if at all possible, is such a better outlook! Totally agree with all of these tips. You'll never know unless you try so be positive and go for it. I love this, what a great motto to have. There is always a way, sometimes we just haven't found it yet! Absolutely couldnt agree more! It's so important to rise above the fears and self-doubts to actually go for our goals. Great advice. One thing that I find it easier to not make excuses is to start with simple goals and slowly build momentum towards the more difficult ones. By accomplishing simple goals you will build confidence to tackle more difficult ones. Great points made. I tend to procrastinate a lot so this has given me a kick up the toosh!